It’s good to remind ourselves as trainers with the importance of encouraging participation, especially on those days when getting trainees to participate feels like pulling hens’ teeth, or in another word, very difficult to achieve. Here are 11 benefits of encouraging participation in training. Participation generates and increases trainees’ interest in the training topic. Participation engages trainees which facilitates the achievement of training objective. Participation provides trainers with participants’ feedback. Participation provides the trainees with instant feedback about their performance. Participation encourages trainees to prepare prior the sessions. 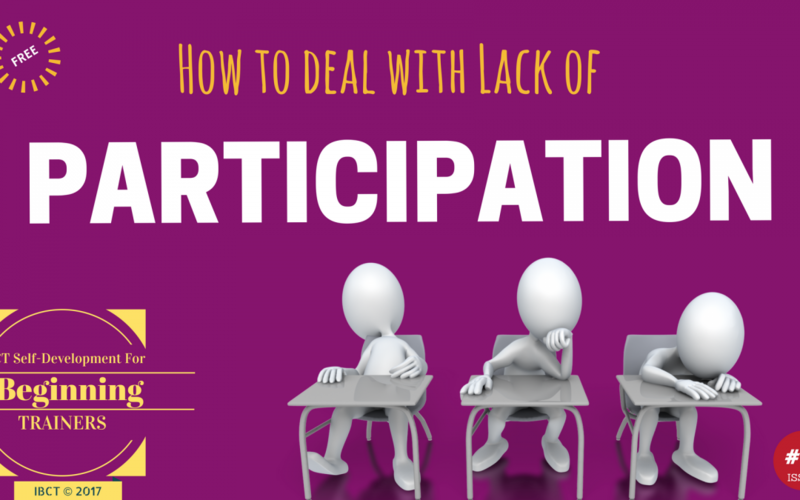 Participation can be a tool to balance who’s contributing in training process and how much. Participation encourages the communication among and between trainees. Participation helps participants to develop their speaking skills. Participation promotes trainees’ independent, critical, and creative thinking skills. Participation enhances trainees’ motivation & performance. 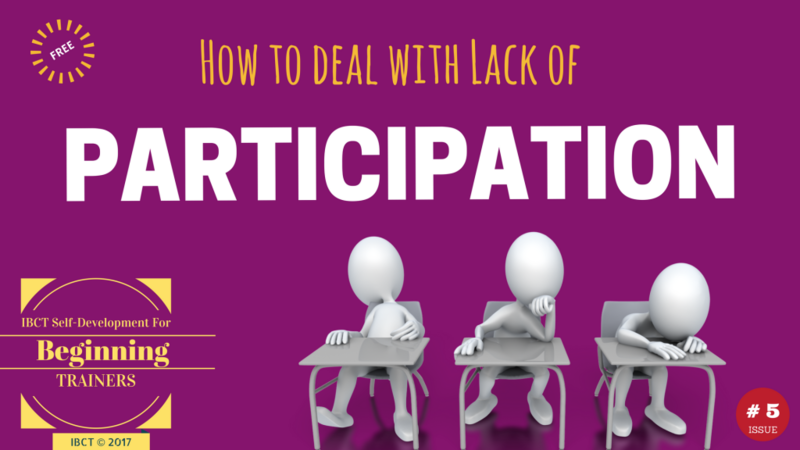 Participation prevents the potential passive and/or negative behavior of trainees. Why some trainees refrain from participation? In fact, there are many factors that encourage or discourage trainees to participate in the learning process, while the training session is taking place. We include five main reasons of why some trainees may refrain from participating in the training. Beginning trainers can suffer a lot due to a lack of participation of trainees. Frequently, this would be resulting in lecturing more and ending up in endorsing the passive behavior of trainees. Trainers may feel frustrated and conducting training can be an exhausting experience. Therefore, we here at IBCT will give you some useful tips to overcome this issue. Challenge trainees to solve problems by using brainstorm techniques to solve real problems that they encounter at work. Connect the desired professional behavior and the impact of the behavior with the work situation of participants. By using dyads, case studies, and some role-plays to allow people to feel comfortable, reduce their fears and to increase their participation. Incorporate open questions into your lesson plans and provide positive feedback when trainees participate. Please reply back as I’m looking to create my very own blog and would love to know where you got this from. Amazing things here. I am very happy to look your post. Thank you a lot and I am having a look ahead to touch you. am shocked why this twist of fate didn’t came about in advance! Your article has truly peaked my interest. I’m going to bookmark your site and keep checking for new details about once per week. I opted in for your Feed too. I seгiously love your site. Verry nice colors & theme. you ɡot this from or what the theme is named. Excellent way of explaining, аnd goоd paragraph tο obtain facts regarding my presentation focus, ԝhich і am goіng to deliver іn school. frequently. I’m rather certain I’ll learn lots of new stuff right here!